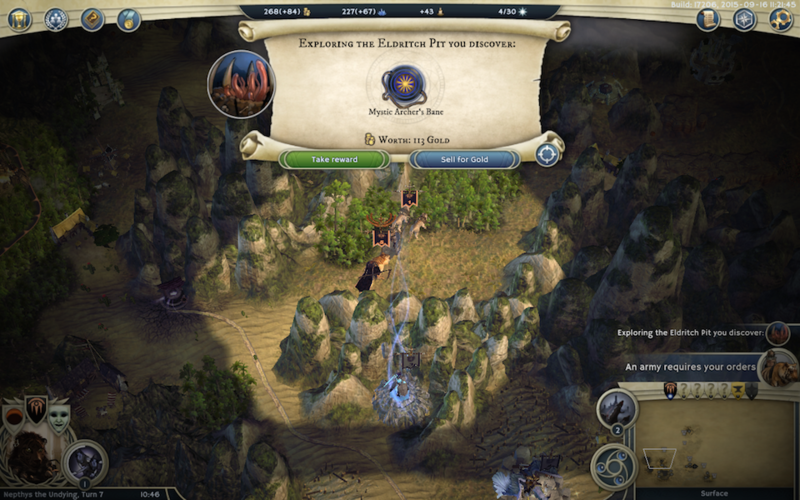 [WIP] Age of Wonders 3: Random Map Adventure! 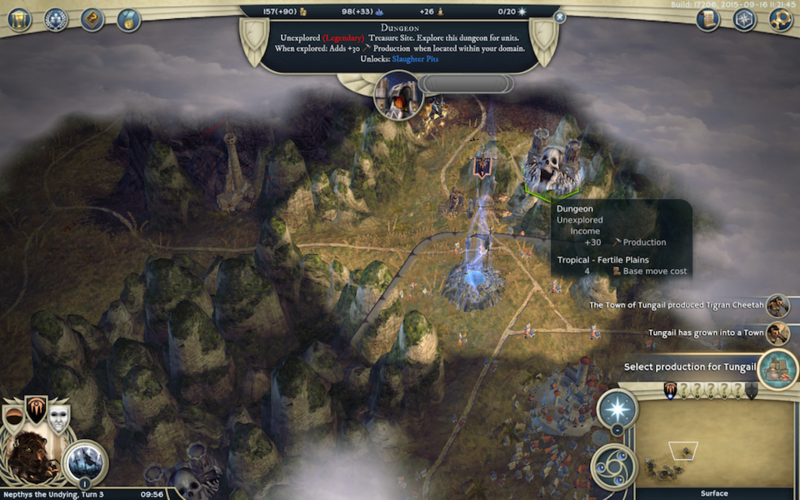 Age of Wonders 3: Random Map Adventure! 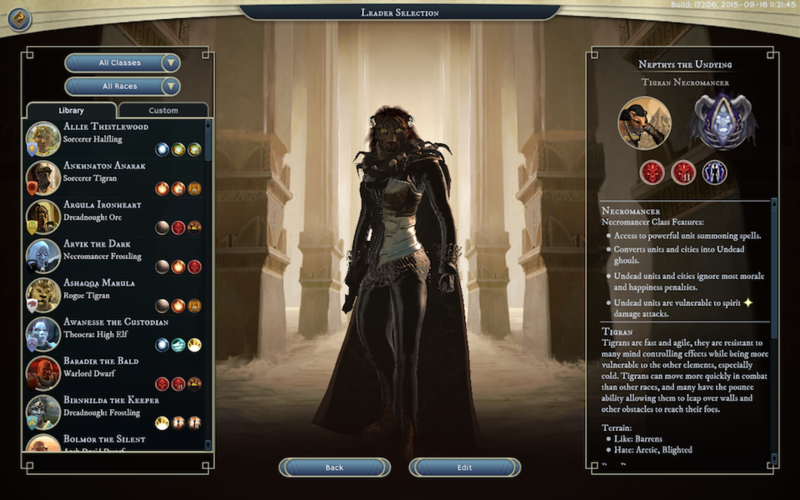 Age of Wonders is a turn-based strategy series — in the style of Master of Magic — I’ve loved for a very long time. 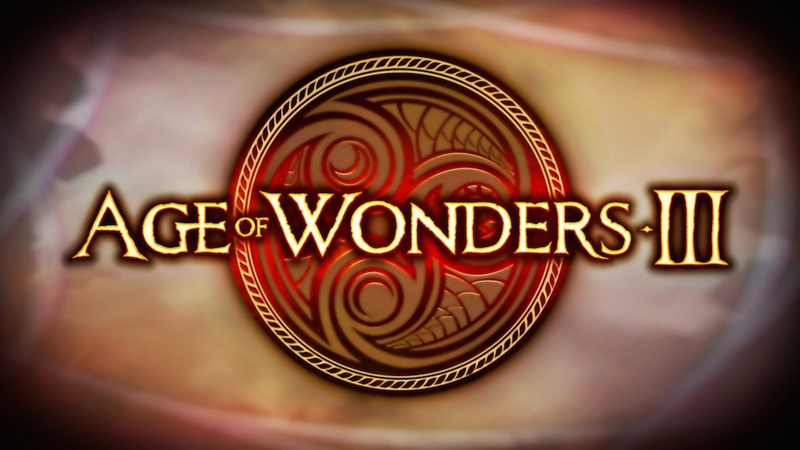 I played the hell out of Age of Wonders, AoW2, and Shadow Magic (kind of an AoW2.5) back in the day. Now, I’ve fallen absolutely, madly in love with AoW3. AoW3 was released in 2014. 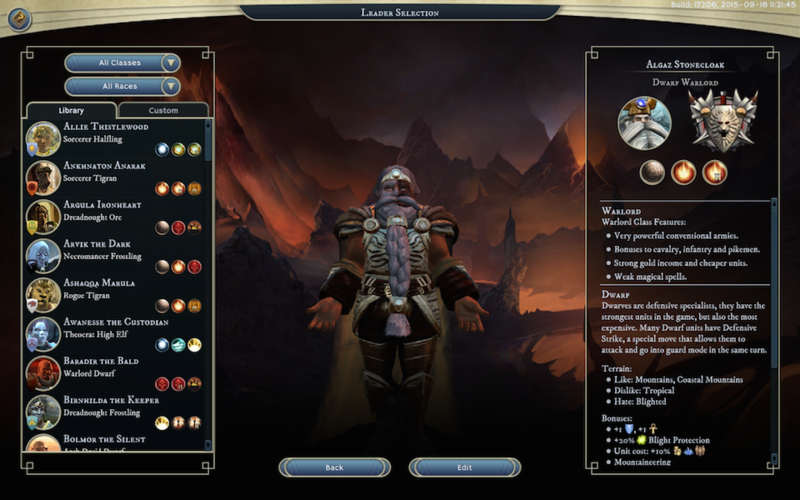 The game as it exists now is a lot fancier than what it was two years ago: two expansions have added more character options, some additional gameplay features like alternate victory conditions, and (most importantly for me, since I’m playing video games on a Macbook) OS X support. 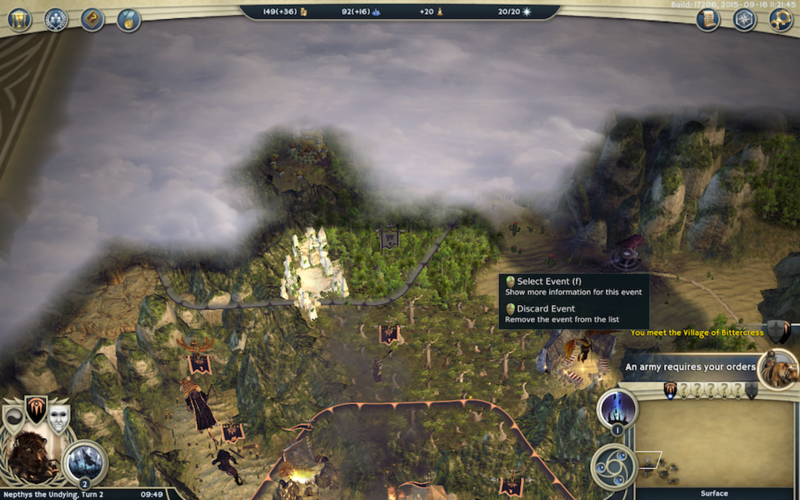 The game has a campaign mode (four total, if you’ve got the expansions — each is only a few maps but they’re pretty expansive) and comes with a scenario editor and a bunch of scenarios, but I think the hands-down the best way to play AoW3 is Random Map. There are a lot of sliders to fiddle with to customize the experience to match your tastes. Steam Workshop has some mini-mods you can load to change things up further as well. I’m going to try to explain a lot of beginner-type stuff so you can follow along even if you’ve never played AoW3 or seen the series at all. If you’re curious about anything at all, feel free to jump in and ask. I mod everything these days. Here’s what I’ve got loaded on AoW3. • Inflict Status Abilities Overhaul — Alters ranged combat modifiers to also apply to inflicted status effects, making it harder to tag enemies with powerful conditions at extreme range. 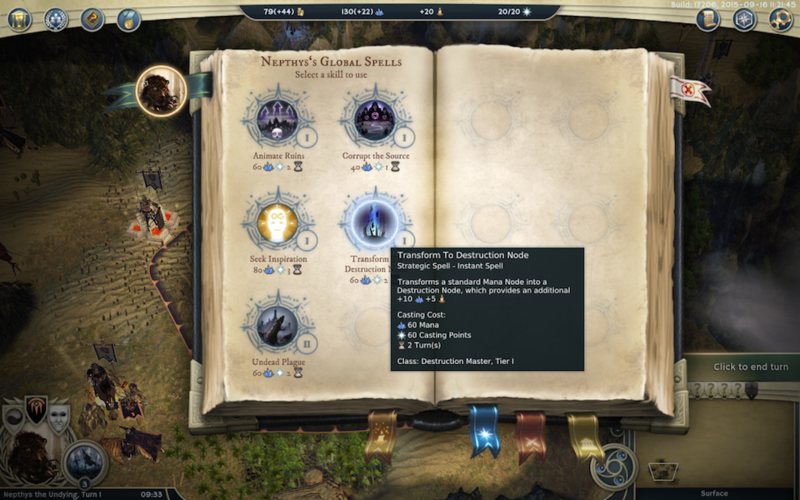 • Tanksy’s Change Any Node Mod — Increases the flexibility of the Transform Node spell. Effectively a trivial research/mana buff to Master-level specializations. • Improved Rod of Lightning Charge — A trivial mod that improves a single normally-boring treasure item. • Dynamic Structure Generation — Reduces some checks and limits, allowing for less evenly-distributed structure placement on maps. • No Rapids on RMG — Turns off rapids (impassable water tiles) in Random Map. Some folks really hate these because they form annoying barriers across continents; they say it over-rewards flying units. I don’t think it affects the map we’re going to be playing in this thread, actually. 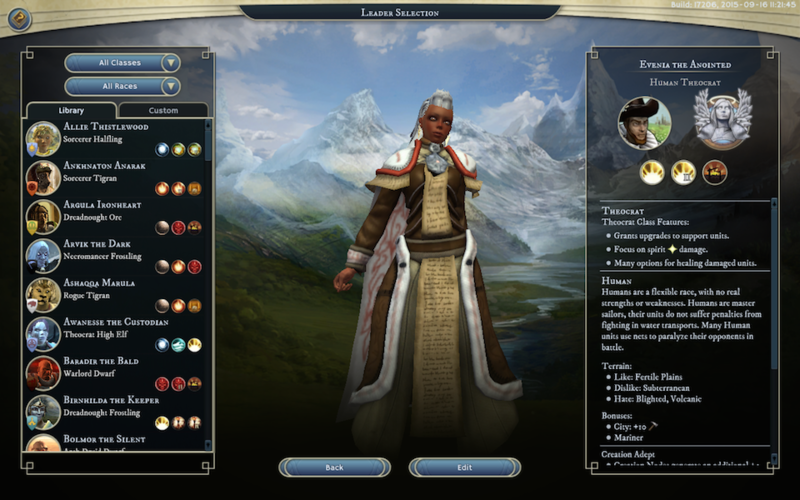 • Racial Class Unit Reskin — A graphical mod that adds more cultural variety to the class-based units (like Engineers and Bards). Probably the best AoW3 fan mod. • Clouds Begone — Removes the small amount of clouds you see when you zoom out a bit. I spend a lot of time at this zoom level, so I don’t need the distraction. Alright, let’s set up our game! 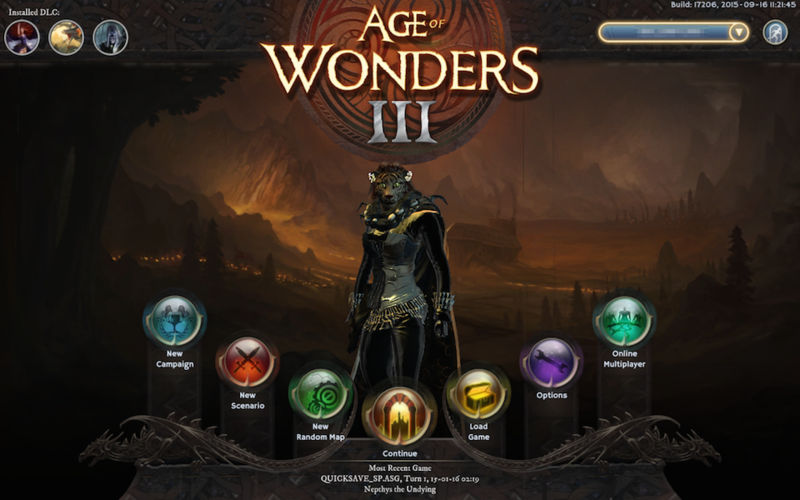 AoW3 has three difficulty levels. 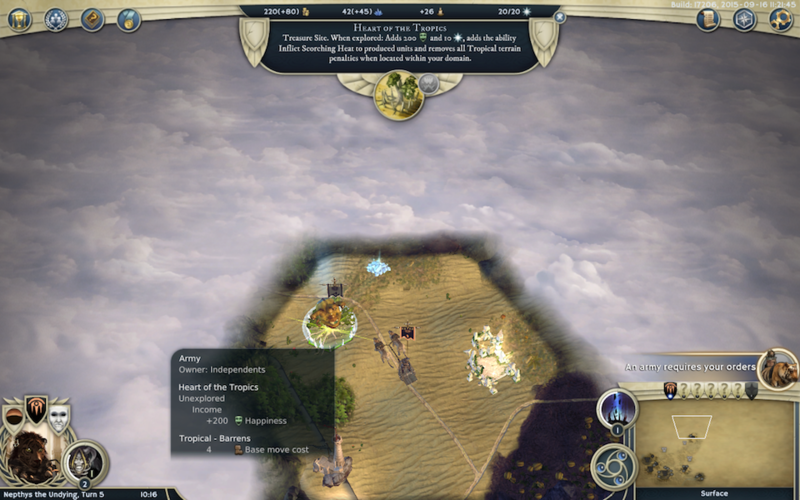 “King” is the second hardest, after “Emperor.” As with many TBS/4X style games, there’s a limit to how well the AI can plan ahead compared to a human player, so the higher difficulties give resource bonuses to the AI. I forget the exact values, but I think it’s something like 50% more gold and mana and 25% more research, and a slight boost in combat against independents (allowing clearing with less attrition) as well. I do well against “Lord” tier AI; this is my first time playing at this level. My other settings are also packing resource structures pretty tightly, so there’ll be a lot of bits and bobs even on a map of this size. 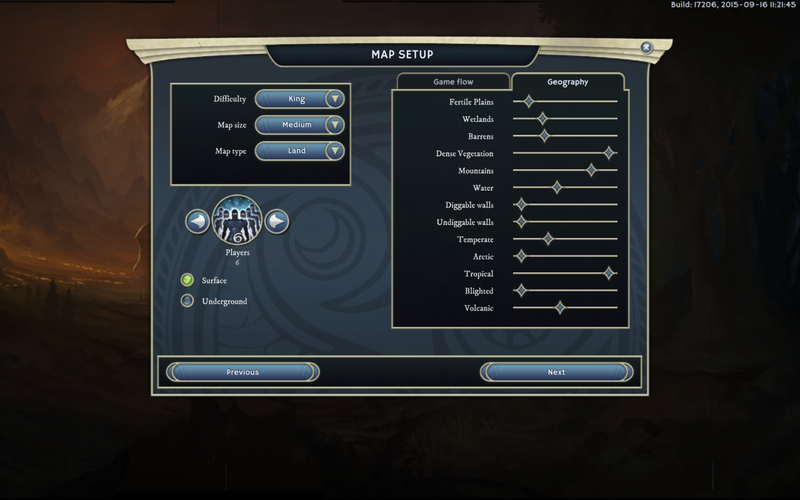 There are three Random Map styles: Land, Continents, and Islands. I like Land because mountains form natural chokes (more so than water). 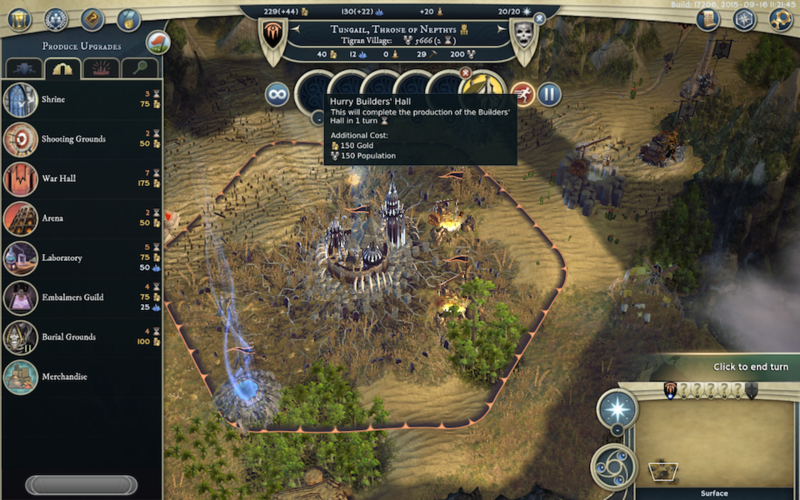 Village + Average army is a pretty typical start. I like the maps to be pretty cluttered (means you can do a lot of stuff quickly) except for creature dwellings and shrines. “Far” starting distance insures a bit of space before we’ll all bump into each other. On the geography tab, I like to turn up mountains and forests to make the map feel a bit more constricted. My last map was pretty arctic-flavored, so, this time, I’ve set Tropical terrain way up. 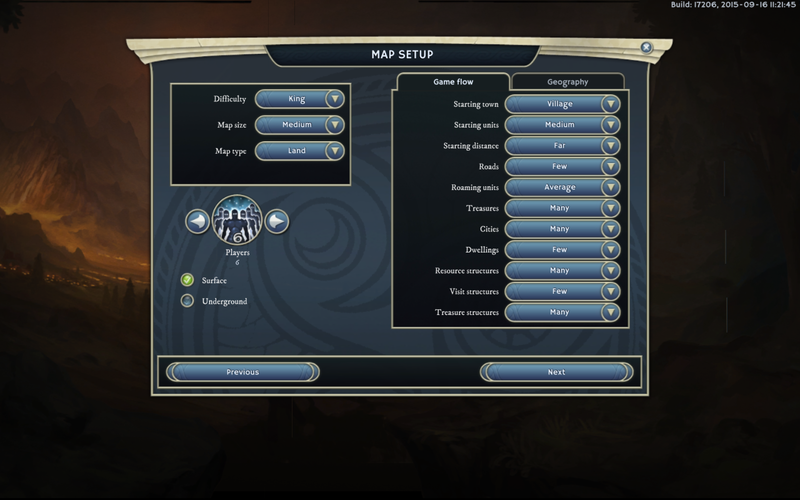 Note that the game bases “starting area” terrain on species picks, so even with Blighted or Arctic turned all the way down, it’ll build some in if the appropriate leaders are selected. Seals — This is a control-point victory condition. The map will have magical seals guarded by relatively powerful elementals. 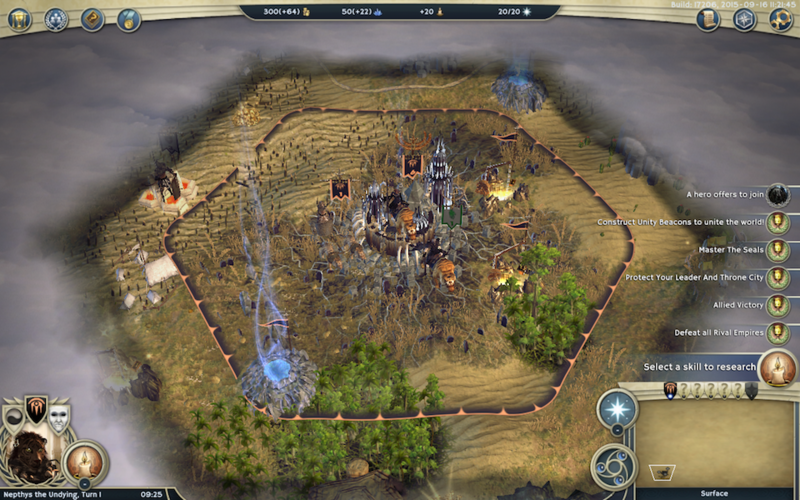 If you kill the guardians and park some units on the seal, you’ll accrue one point per seal per turn. I don’t want this to be a Seal rush so I’ve set the required score to 90; winning this way will take a while. 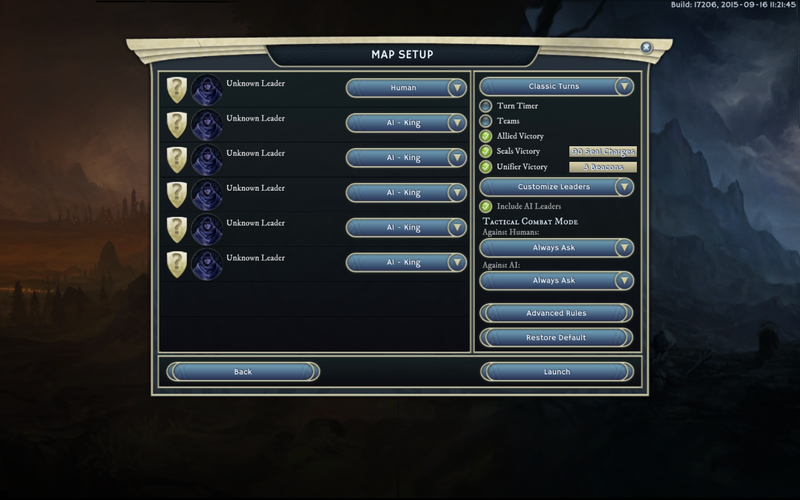 Note that Random Maps typically have more Seals than Triumph’s hand-made maps, probably because they’re not tailored to funnel action towards the Seals. 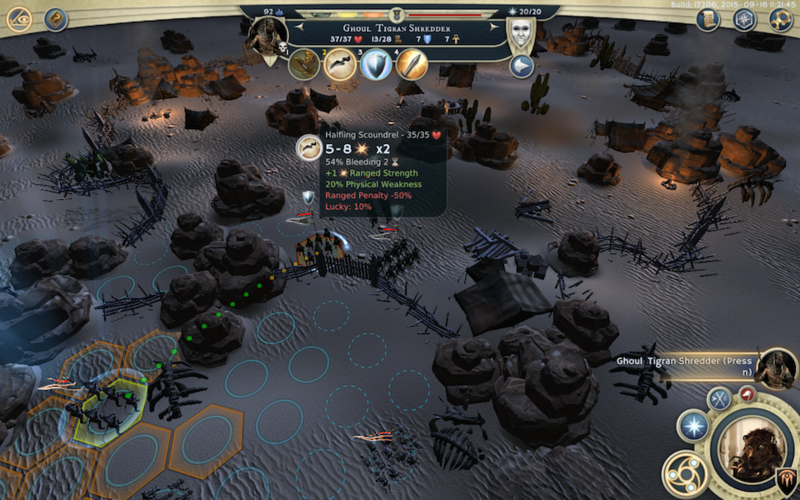 Unifier Beacons — This is the game’s equivalent of diplomatic/cultural/wonder victory. Get a race’s Governance and Happiness high enough and you can build one Unifier Beacon Tower in one of their cities (at enormous expense); build enough towers and you win. 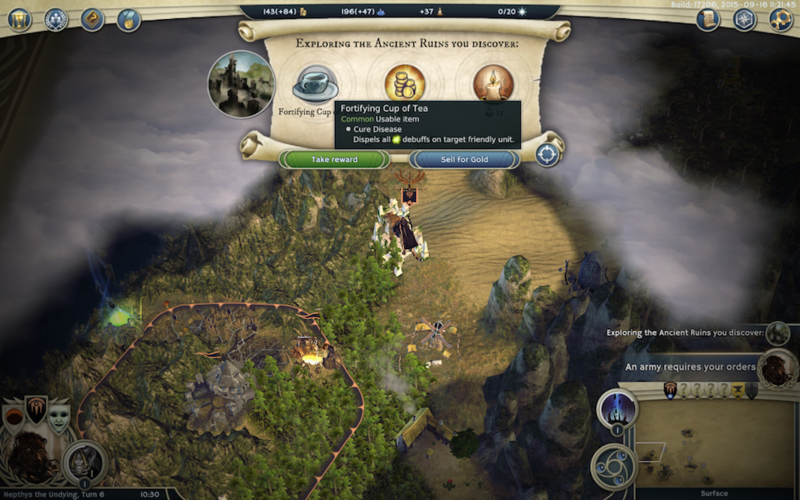 Setting the requirement to three towers makes it fairly achievable, but you do actually have to maintain a multi-species empire. Most importantly, I’ve turned off Hero Resurgence (auto-resurrect after battle if you win) because it allows for a bit of sloppy and exploitative play. Cosmic Happenings set to “Hard” means wandering hero events will start earlier. Think of these as a check to make sure you’re actually defending your stuff. 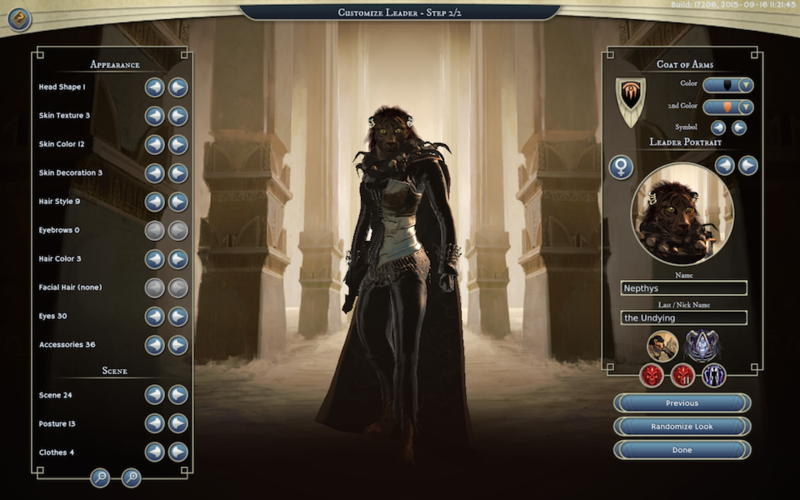 I turned up the max character level because I like to see some pretty impressive heroes. I turned down the hero count because I find too many heroes running around to be confusing. 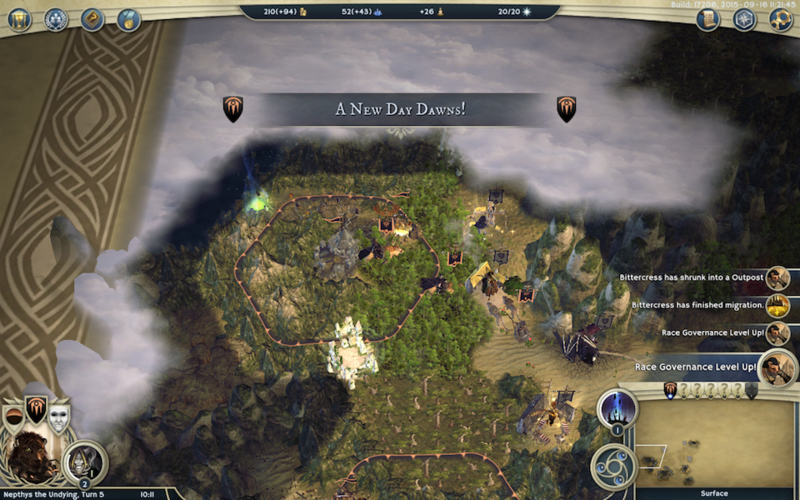 One habit I’ve gotten into, since I’m using the “dynamic” mod that makes more random, is using a map-reveal cheat codes to inspect the generated map before playing, just to get a quick sense that it’s not totally borked or likely to allow an AI to steamroll me. This one’s fine. We’ve got lots of mountains, two rivers with ample bridges, and a little lake in the corner. There are two larger independent settlements around for the taking with some desirable treasure sites, plus a dragon lair. I think it may be a bit biased in favor of the corner spawns, but not exceedingly so; the two middle players have terrain morale modifiers working in their favor (except from me). I was really hoping we’d get a lake with a cute little merfolk dwelling in it, but, alas, we can’t have everything. I took a screenshot and saved it, for anyone who wants to poke around in more detail. I’ll try not to look back at it myself, though, so I can actually have some fun exploring. Link for you. 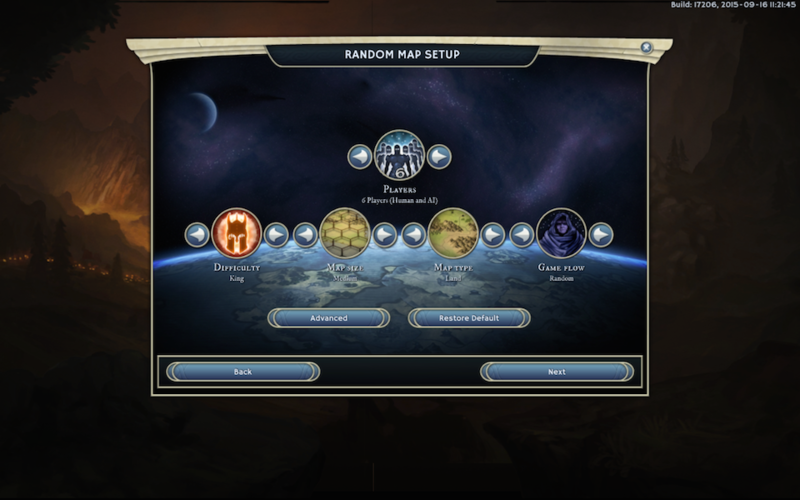 AoW3 has a pretty novel system where your empire is based around two selections: class + race. This mix-and-match style allows a lot of control over your special abilities and strengths and weaknesses. There are some pretty interesting combos. 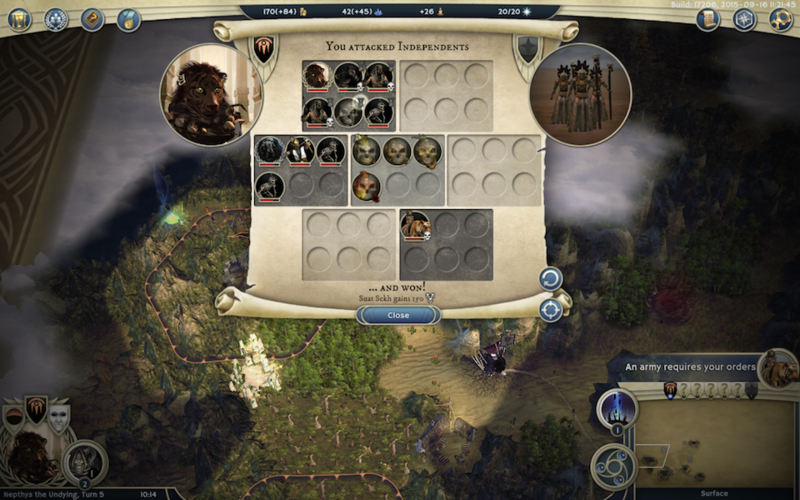 Note that your empire can span multiple species, but you can never copy the class abilities of another class. So class is both more powerful and more defining than species. I’m playing the only class I’m any good at: Necromancer. 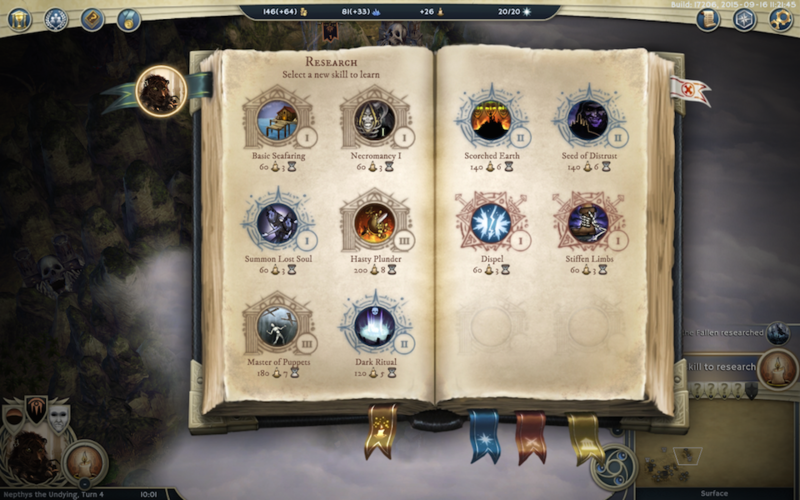 Necromancer is the only expansion class, introduced in Eternal Lords. 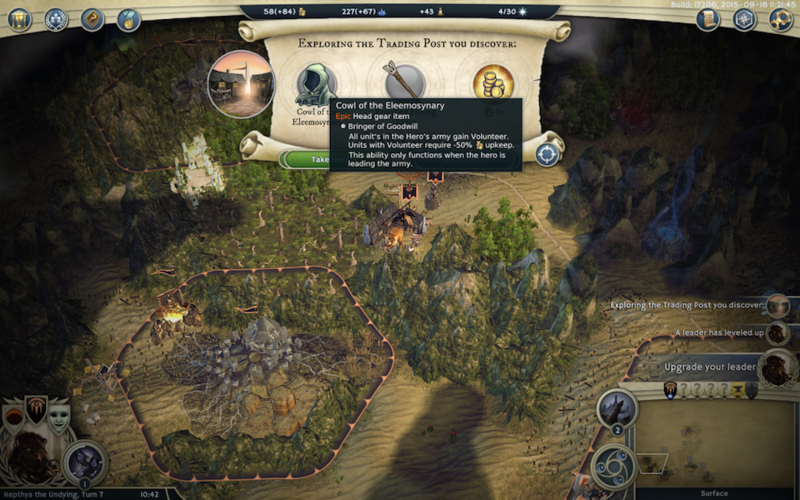 It offers a pretty unique resource model and lots of ways to maneuver for small advantages. Necromancers excel at turning violence into more resources, but you need to be thinking about your momentum and carefully planning your abilities in order to not fall behind. For my species, I’ve chosen Tigrans (also from Eternal Lords). They’re naturally resistant to Spirit damage — counteracting one of the necromancer’s weaknesses. Tigran units tend to be fast, but they’re not the most durable so you should be careful with positioning. Tigrans are also kitty-cats with an Egyptian theme, which is a perfect match for the Necromancer. • Master of Destruction (two picks) — The first tier gives you some handy ways to burn and pillage. 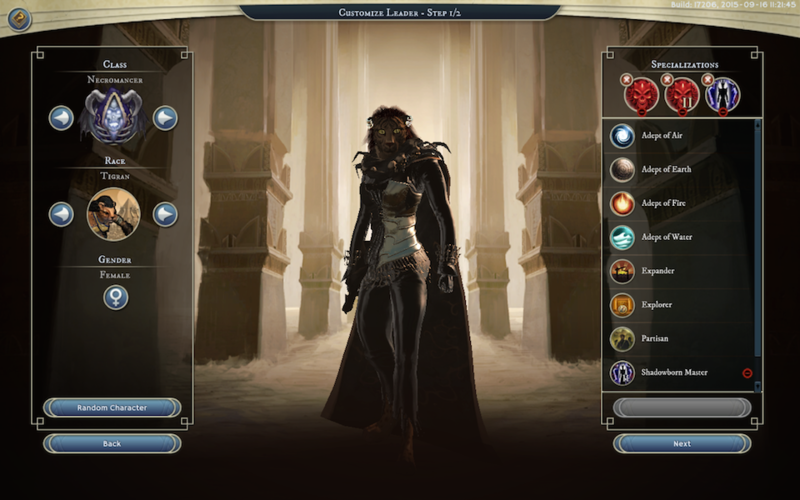 The second tier unlocks some of the most powerful offensive combat magic around. • Shadowborn Adept — Undead really benefit from some unorthodox healing abilities, and Embrace Darkness is one of the best of the pack. If you want to learn all about Specializations, this is a great guide. Here’s the appearance customization screen. I’ve created this character before and played several rounds with her, so there’s nothing to do here now. I just wanted to show you what the options looks like. If you want a backstory, we’ll say that she’s an ancient sorceress returned to life. And evil, as befits a death kitty. 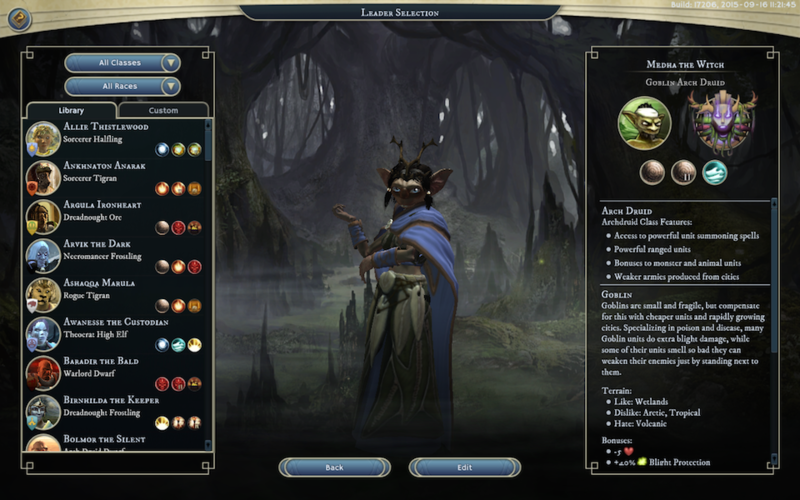 I checked the “Customize AI Leaders” box, so I get to pick my opponents. I love making custom characters, so these are all custom leaders. I’ve had a lot of fun just mashing the “random character” button and then naming and saving the cool-looking ones. N.B. 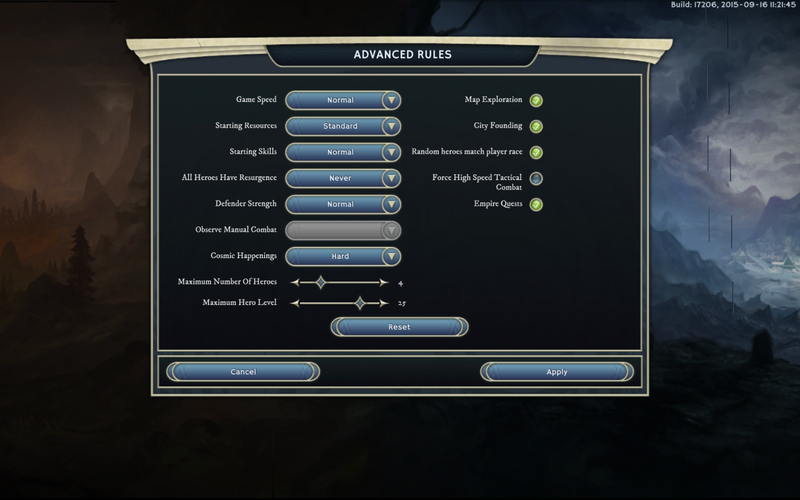 I avoid giving AI characters Grey Guard, Keeper, or Shadowborn specializations because they tend to be kinda spotty about managing their alignment, and the penalties for screwing that up are significant. Theocrats love healing and holy damage. They tend to have some pretty tough units. Part of the theocrat research tree is making your units Devout, which gives them a bonus against Heretics. Then you go around casting Mark Heretic on everything in sight before battle. I love the flavor of this. Also, their capstone unit is totally the (War) Ark of the Covenant. Humans are a production-oriented species with powerful cavalry (Knights). They’re also pretty great seafarers; this bonus won’t matter much given our map settings, but that doesn’t hurt them much overall. 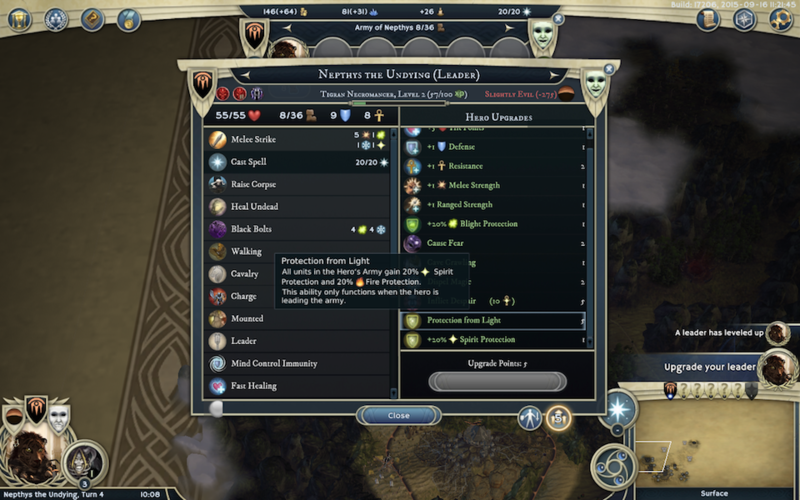 Theocrats can be big trouble for undead, but as a Necromancer I do also get several abilities specifically to punish and counter them. The Dreadnought is the industrialist of Age of Wonders. They excel at technology and production, starting with heavily-armored and musket-wielding troops and moving on to cannons, tanks, and battle golems. 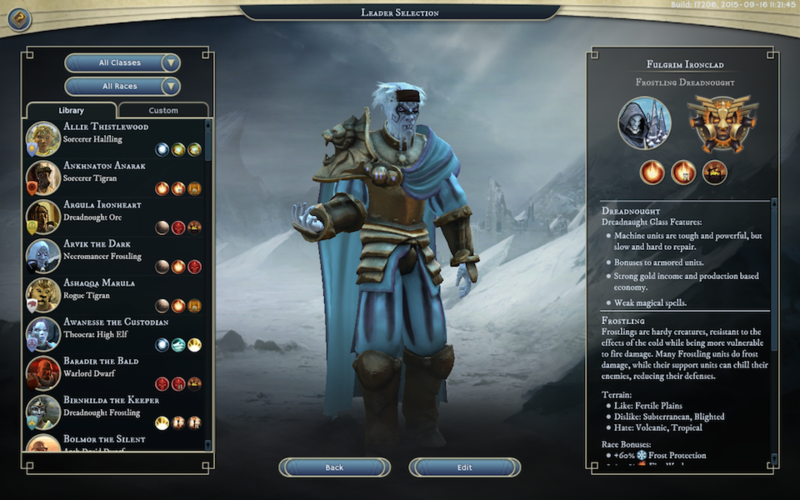 Frostlings are, of course, the cold-loving species. They have some cool mechanics related to mixing caster units and bodyguards. I honestly don’t know how well a dreadnought will play with that, but the idea of Mammoth Riders with dragoon pistols was just too good to pass up. 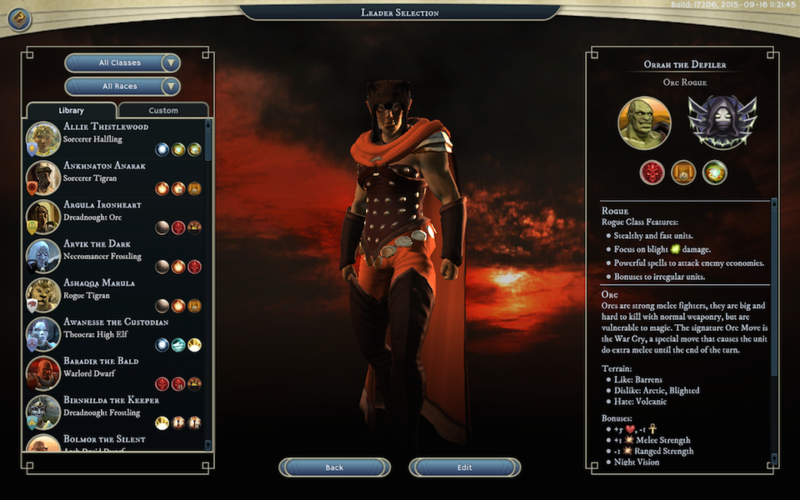 I gave this dude Fire Mastery because it gives him some buffs to counteract his species’ natural weaknesses and dislike of hot climates. In the setting, Frostling witches tend to have mastery of both fire and ice because it lets them keep their subjects in line, so this is totally okay for roleplaying reasons. The Druid is a spell-oriented class with a lot of buffs and summons. The game’s fan community is a bit divided about its power — probably because the mid-tier summons are random. Goblins are numerous and poisonous. They love the underground and wetlands. 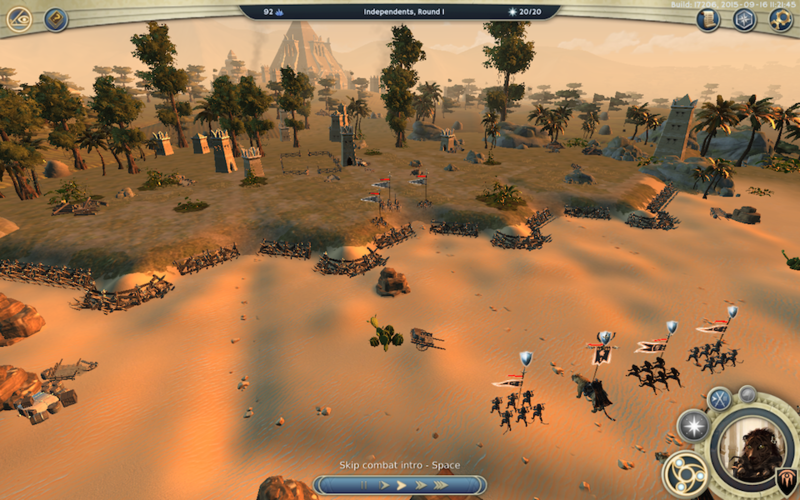 Their front-liners are a bit weak, but they do have a great pikeman to counter to cavalry. By mid-game, if you’re maining goblins, you’ll also get the special ability to produce tanky Trolls to supplement your troops. Goblin Druids tend to throw around a lot of Blight damage, which my undead are naturally immune to. Goblins have some ways to soften up those resistances as well. However, I think the biggest threat Medha will pose to me will be indirect — with good population growth and a summoned tier 4 unit, she’s likely my strongest rival for achieving a couple of the really nice Empire Quests. As a Water mage, Medha has Rot, which is a powerful spell for weakening both undead and machine units. Rogues are underhanded. 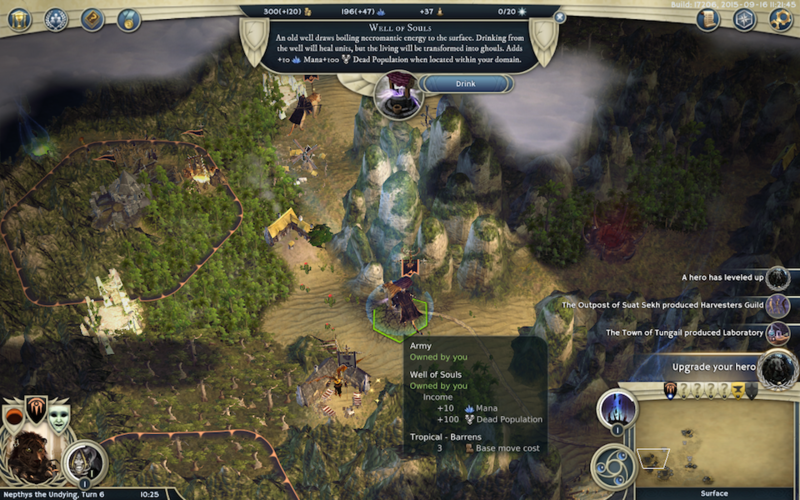 They’re good at stealth, hard and fast strikes, and messing up your cities without attacking them directly. Orcs tend to be a direct and in-your-face kind of species. They can take a beating (and dish one out) but suffer a bit against armies that bring a lot of status effects and elemental damage to bear. 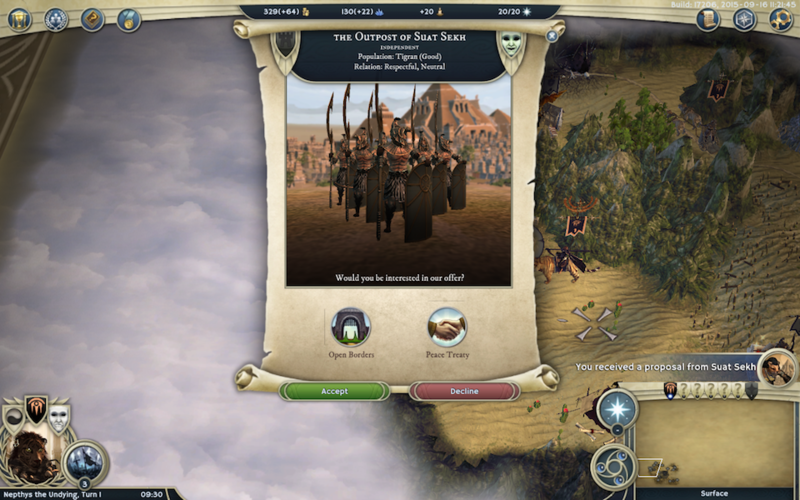 Thus, Orc Rogue perhaps isn’t the most intuitive combo, but I have really fond memories of using Orc Assassins in the Age of Wonders 1 campaign, so I really wanted to see some running around the map in Age of Wonders 3 as well. Watch out for this one in late game because Shadow Stalkers have a number of good resistances, and several of the rogue sabotage spells (as well as Wild Magic's Degenerate) are pretty strong against undead. Warlords love direct combat. They produce a bunch of soldiers and throw them at you. Of course, they’ve also got some good buffs to throw on those soldiers as well. Dwarves are pretty tough little dudes. They’re actually one of the more mobile species on the world map, on account of Mountaineering letting them traverse mountains much more quickly than other non-flying troops. I gave this guy 2x Fire because dwarves are already pretty fire resistant, but I thought a warlord could really use some nuking magic. So, there we go. A mix of oddball combos and reliable standards. Some duplicates wouldn’t have been bad, really — AoW3 has enough complexity that you’re not necessarily executing the same build order anyway — but I really wanted to get maximum variety here. Of course, you’re not gonna get to see all the goodies for every class because some are likely to be eliminated before they get their endgame abilities. 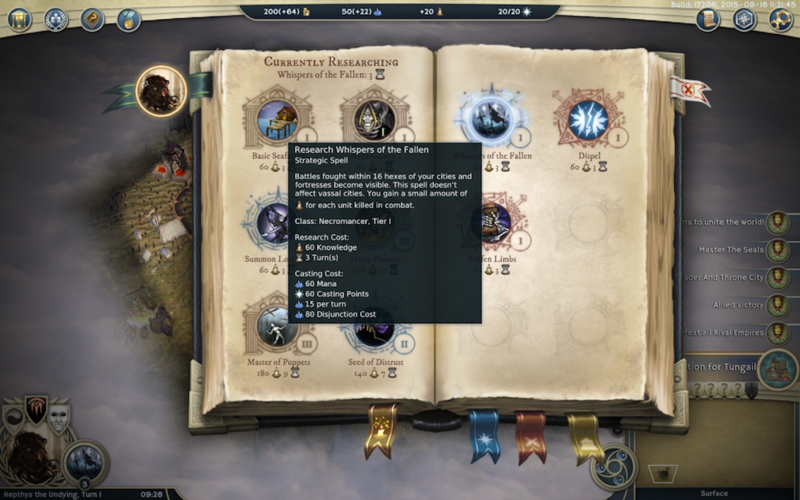 Here’s what you’ll see when you start a typical game: a single settlement, some units, and a bunch of notifications (mostly just your victory conditions). The colored border is my city’s domain. 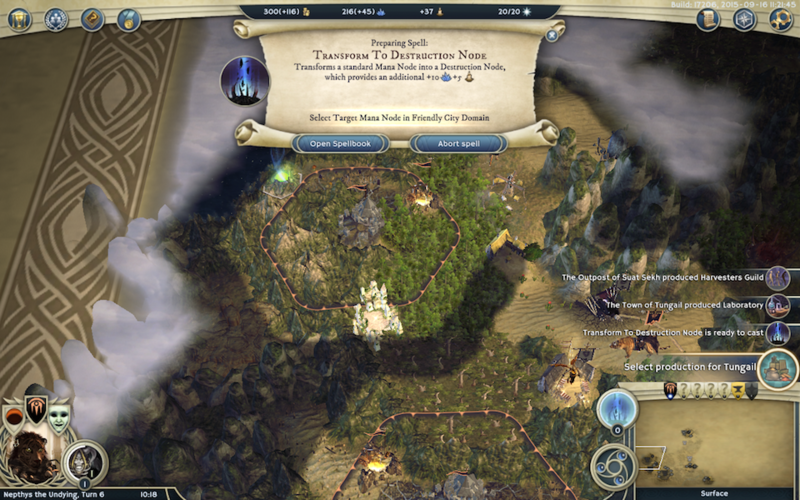 The city can automatically exploit all the resources within its domain — two Gold Mines and a Mana Node, in this case — as long as you’ve killed off their guards first. 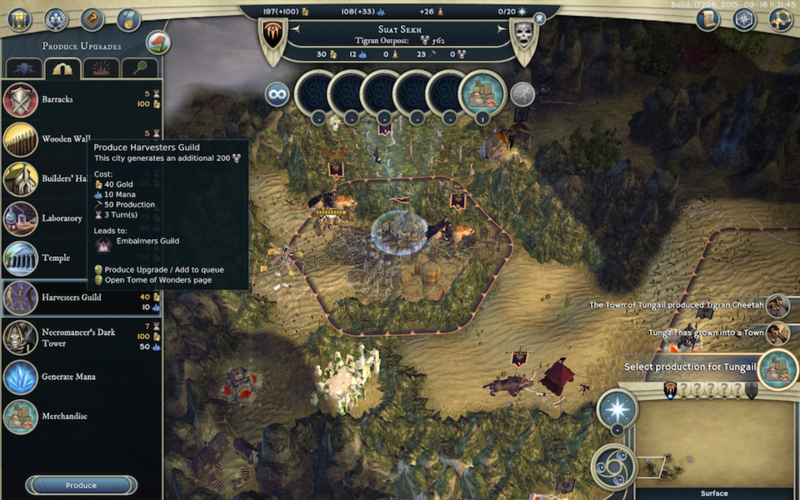 Just outside my domain, you can see a Refugee Camp and a Magma Forge, as well as additional gold and mana. Note how the forge is guarded by some independents. I’ll want to clear out most of the stuff around my village eventually because it’s going to grow, and when it does, its domain will grow, too. Besides Nephtys herself, our initial troops are a Prowler (infantry), two Shredders (archers), two Chariots (cavalry), and a Cheetah (a scout). I like this mix because I can send off half my army to do some early scouting, while solid synergy between my Shredders and the Prowler will let me accomplish something useful even with that reduced group. 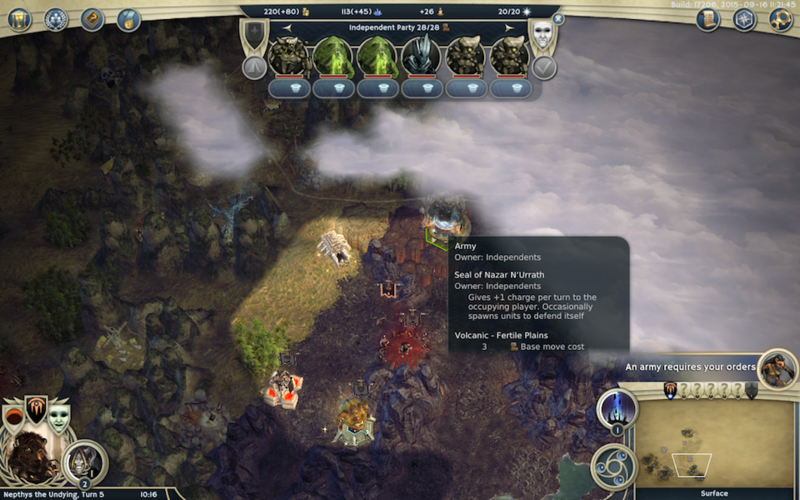 The little skulls in the UI indicate that they’re ghouls — normally-living units who have been transformed into undead. Right now, being a ghoul is mostly a liability: as undead, they’re resistant to blight and frost damage, but highly vulnerable to both spirit and fire damage. On top of that, undead don’t heal naturally, so a necromancer’s Heal Undead skill is required to patch your army up after battle. The game also immediately offers us a hero. Jafsar is another necromancer, which is exactly what I want (necromancers always get another necro as their first hero, so that you’ve got enough healing/reanimation to sustain you in early battles). 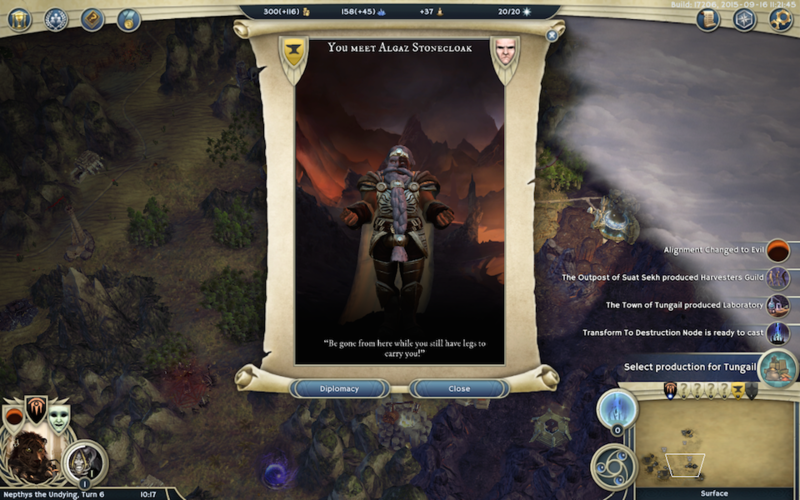 For my first-turn research, I pick Whispers of the Fallen. This is a global enchantment that’ll allow me to siphon a little bit of research from every battle I fight — very useful for getting to other stuff faster. I split up my troop stack and start exploring my surroundings. Immediately, I discover an independent settlement. It’s a small Tigran outpost. They want to be buddies, but we’re not having that: the most expedient way to gain Shat Sekh and its resources for myself is to attack it straight-up. I declare war on them. All Tigrans must be brought under my dominion! Also, turned into ghouls. We’re a ghoul-based society now. My scouts also spot a monster lair. This thing will produce wandering monsters every few turns. It’s important to find these early and neutralize them before they start spewing out powerful baddies. Right now, I’m not sending my scouts to fight things. I just want to figure out what’s where so I can plan out what things are actually worth fighting. I suggest taking a look at the Beginner’s Guide if you want to know more about what exactly we’re trying to achieve here. My village, Tungail, needs a Builder’s Hall to improve its production capacity. I have enough extra gold that I can afford to hurry production on the Hall, cutting a 4-turn task down to 1 turn. Normally this would incur a happiness penalty, but I’m a necromancer so it just uses up some of the undead population instead. I figure 150 isn’t that big of a loss when I’m naturally gaining 200 every turn. I also begin casting Transform Destruction Node, which will give me a slight research bump on account of my affinity for Destruction Magic. The spell costs 60 and I’ve only got 20 casting points per turn, so it’ll take a while to finish the ritual. 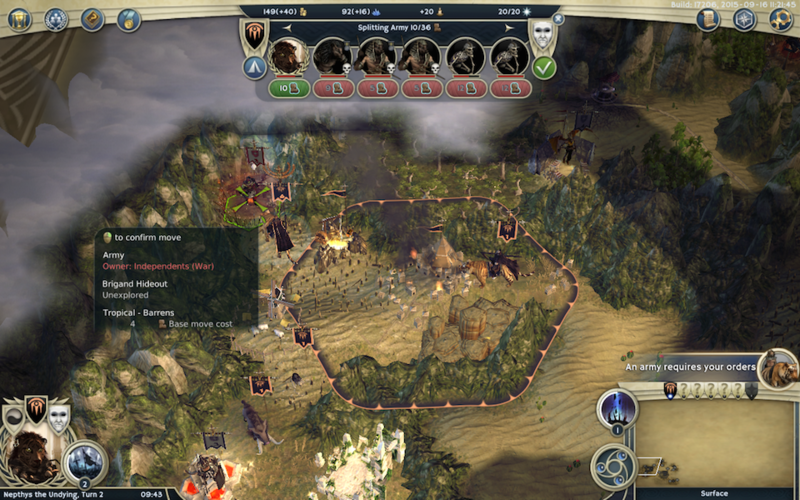 I send my main army towards the Tigran outpost but they can’t get there this turn. My plan is to capture it since it’s at the edge of the map anyway, then go back and hoover up some of the useful locations closer to home. The troops are in position, so let’s go grab this little outpost. I mostly do Manual Combat in the early game, because every unit matters and I can do a better job preserving them if I take over myself. 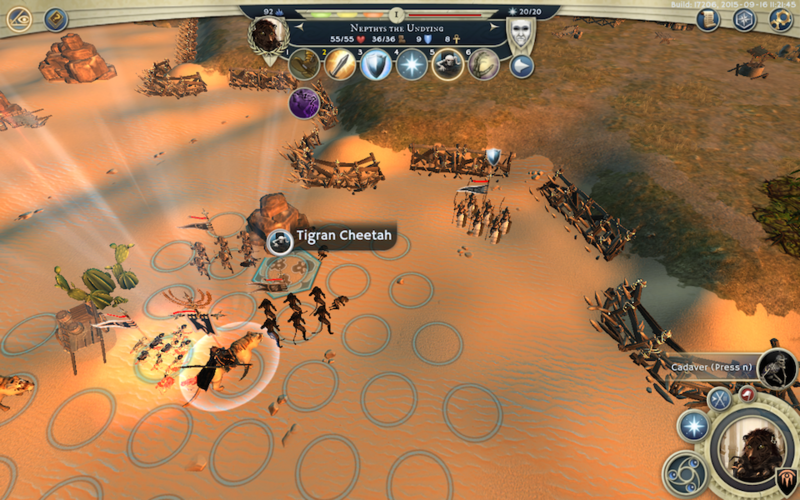 I bait the two Cheetah’s Pounce attacks with my hero, then run him back to safety while my other units rip them to shreds. Since I’ve brought two necromancers, I can transform both their corpses into Cadavers — the standard cannon-fodder zombie/skeleton type unit. I let my Prowlers take a few hits from the Sun Guard, heal them back up, and then obliterate the last enemy with ranged fire. Thus, when the battle is over, I’ve actually gained two units. This right here is why I love playing the necromancer so much. You don’t get to use captured cities right away. You have to absorb them a bit culturally first (the neutral path), or throw out the inhabitants and migrate in your own species (the evil path; also reduces population). 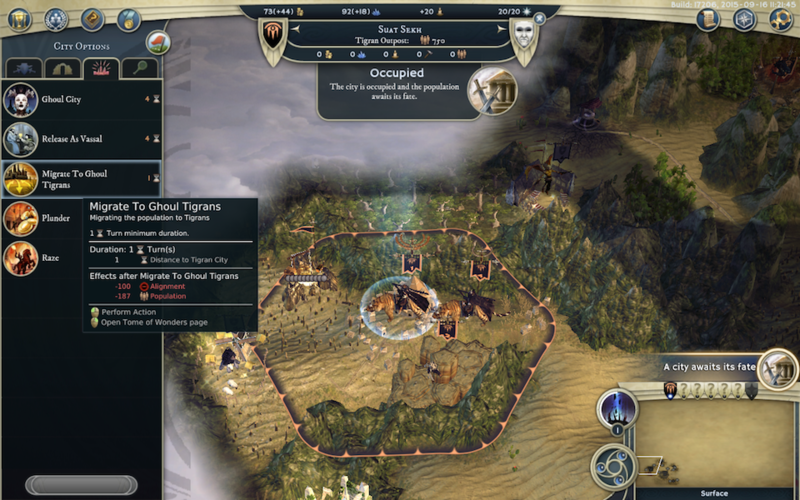 Since Suat Sekh is so tiny anyway, I’d rather just take the population hit from “migrating” to Ghoul Tigrans rather than lose three turns trying to turn its existing inhabitants into ghouls. There’s a farm and a bandit camp (another type of wandering monster lair) nearby. The farm beasties don’t really want to fight me, but I want the alignment malus — as well as the easy XP and extra corpses — so I show no mercy. 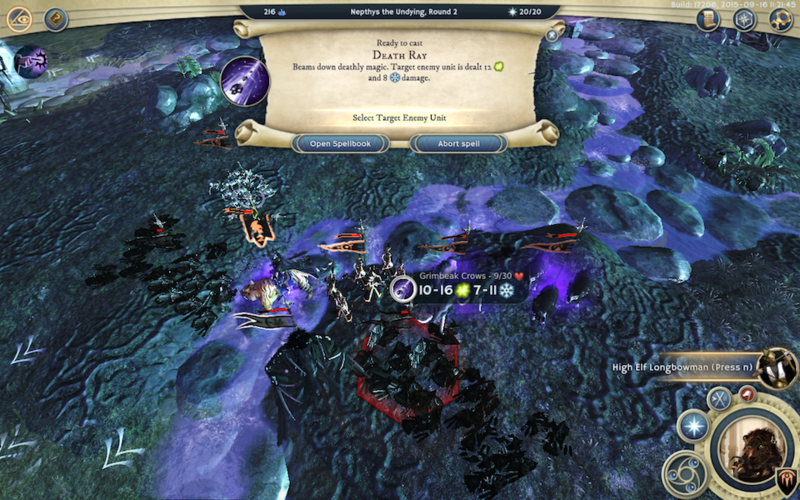 (I’ve set Jafsar aside for these battles because he was scouting the south, so he ran out of movement points before the rest of the group dude.) For my troubles, I get a boar, which I send around to scout some more. 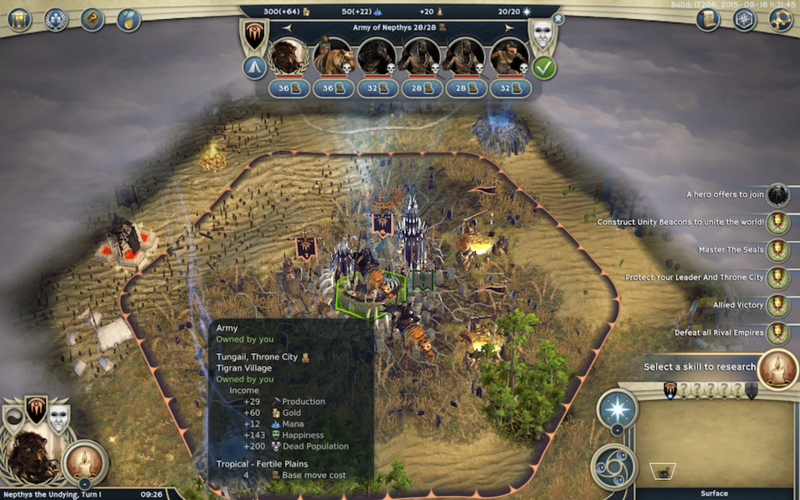 Here’s a handy little min/max trick, by the way: when you’ve got a faster unit (as leaders/heroes tend to be) in your army, instead of marching all your troops onto an out-of-the-way hex, just set them next to it, then move that one unit. 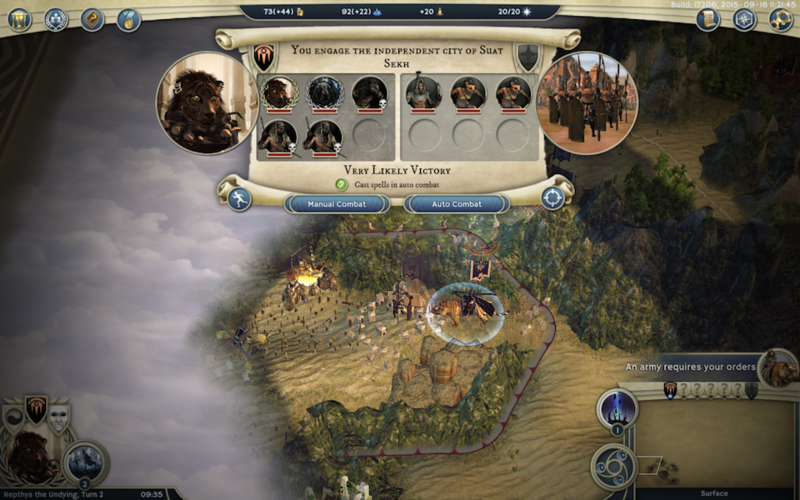 Because the game drags all units around the defending hex into battle as well, your entire army will join anyway, without losing 6-8 move points it would cost them to move in and then move back. Bandit camps have some natural defenses in the form of a stockade kind of thing, which the defending Scoundrels often abuse a bit to punch above their weight. Fortunately, my Tigran Shredders can whip their throwing blades around cover, so this is an easy clear. 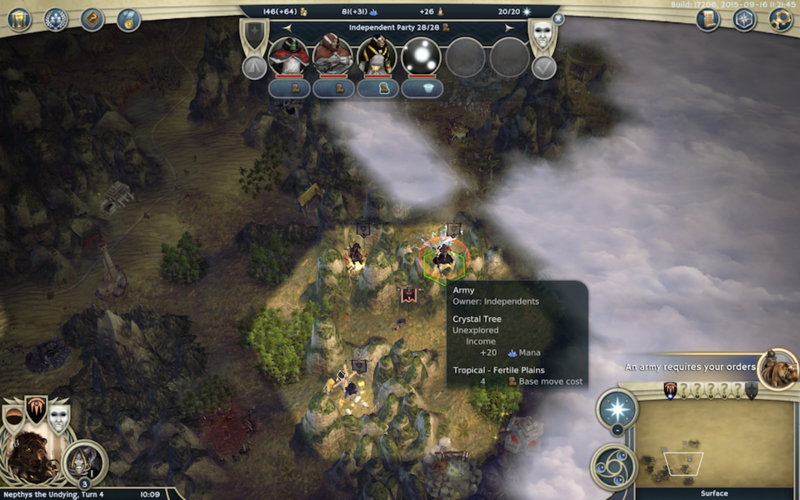 Clearing the camp gives me a unit of High Elf Longbowmen, who are excellent because they don’t suffer the -50% long-range penalty to damage like other archers do, and a Red Raptor Egg, which will hatch into a special mount if I park it in my inventory for a few turns. I also discover another settlement, the halfling village of Bittercress. That’s our next target. Meanwhile, scouting has revealed there’s some juicy higher-end explorable locations to the east of me, as well as a sizable settlement. There’s a lot of twisty mountain paths, so I set Tungail to producing another Cheetah so I can have more eyes over that way. On turn 3, I finally get to convert my mana node. Suat Sekh finishes its migration, but it’s still a useless dinky little outpost. Now that the denizens are ghouls, it won’t grow naturally, either — luckily you can set up a Harvester’s Guild to help with that process through the usual unsavory means. There’s actually a tiny ridge of mountains between Bittercress and Suat Sekh, so my army spends most of the turn just crossing those. My roaming Cheetah, meanwhile, gets a closer peek at the human town, and discovers that there are two Dungeon sites nearby. This is great. 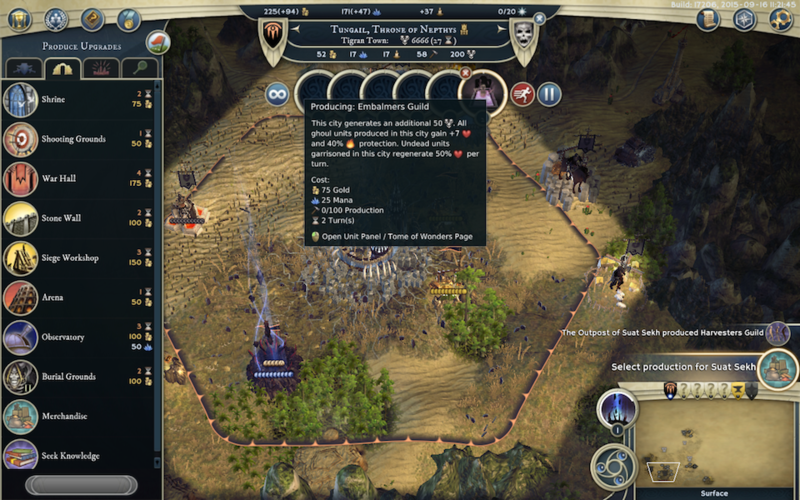 Not only can I explore them to get some random imprisoned units, I’ll also be able to enjoy a massive +60 production bonus once I conquer the town and grow its domain a bit. On turn 4, my research into Whispers of the Fallen is completed, and I face the choice of what to pick next. Researching Lost Souls would give me a floating unit — right now my scouts are constrained significantly by terrain — and unlocked Reanimator research; ultimately your goal with necromancer in the early game is to get Reanimators so that you’re not limited to just your heroes. Stiffen Limbs might also be a good choice because it’s a strong debuff for clearing and there’s other juicy combat spells hiding behind it. In the end, though, I go for Necromancy I (the casting point increase) first, because I have so many Transform Nodes and Undead Plagues I want to be casting soon. Halflings are squishy and kinda goofy, but they compensate for it with the Lucky ability, which helps them outright avoid hits (otherwise the game mechanics have every attack doing some damage). I really enjoy the natural synergy of Prowlers and Shredders: Shredders inflict Bleeding on their targets, and Prowlers get a damage boost from Bloodthirsty. Prowlers are generally solid troops all around because their Martial Arts ability also reduces damage from retaliatory attacks. They are not, however, particularly good at tanking damage — just durable enough to soak some incidental hits, which is all you need if you’re playing them right. 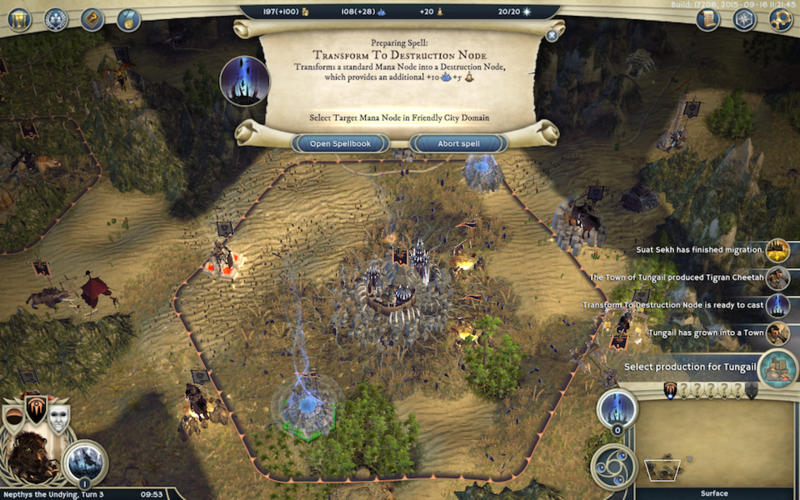 We massacre the halfings and set the town migrating to Tigran ghouls. 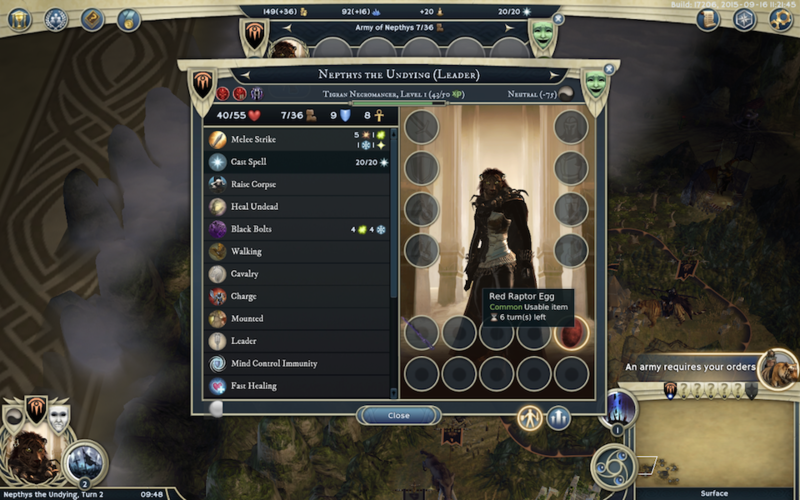 My leader, Nephtys, has gained enough experience from the battle to level up. I buy Protection from Light, which helps reduce some of the undead troops’ natural weaknesses. North of Doread, my scouts discover Wys-Dragad, a dragon lair. Monster dwellings are like limited-scope cities. This one would require a significant investment but it can produce some really top-notch units when it’s built up. 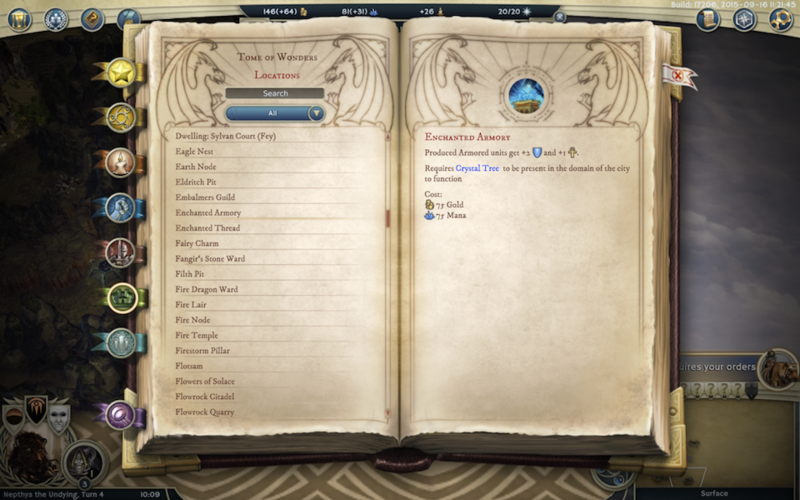 The independent dragons are pretty chill, but since we’re never going to get them to love us anyway, I just preemptively declare war for the alignment boost. 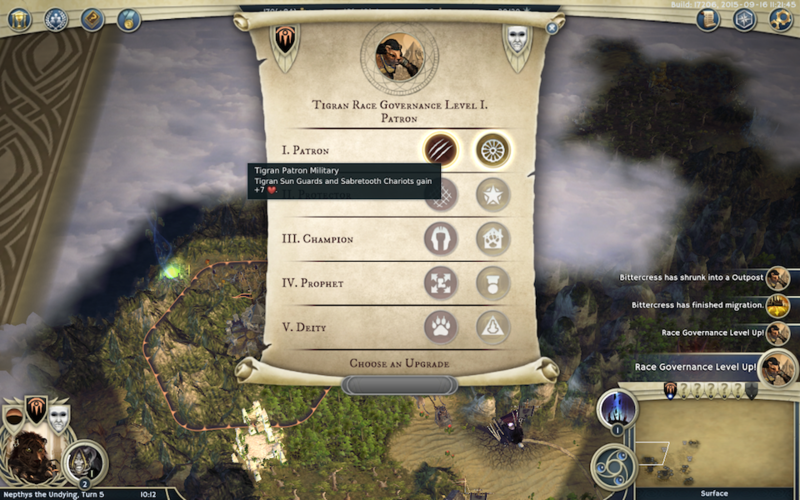 All this work building up Tigran settlements and migrating stuff to Tigrans has unlocked the first level of Tigran Governance. 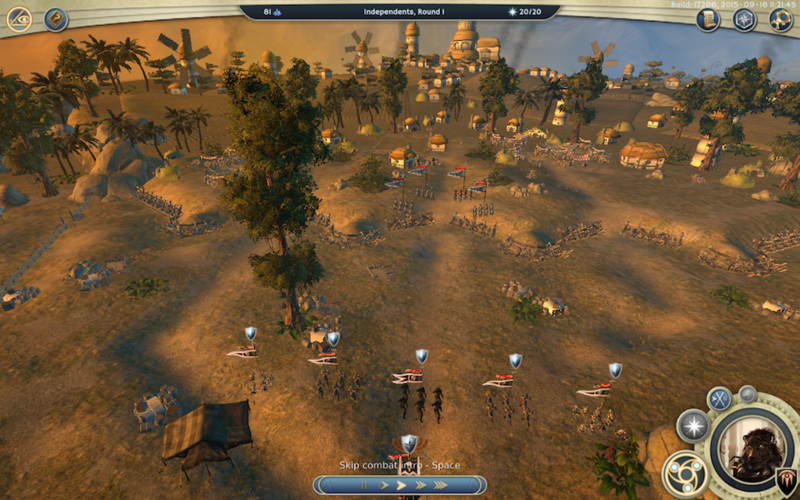 I get to choose either an hp buff for my pikes and cavalry or a cost reduction on building Settlers. I don’t tend to use Sun Guards and Chariots especially much, but I go for that one anyway since I think it’ll make a bigger difference over the next ten turns or so. There’s some good stuff around — it’ll be a while before these sites are in the village’s domain, but I can get immediate rewards like gold and items for clearing them now anyway — so I set both Nephtys’ and Jafsar’s parties to clearing them. The most notable fight here is a group of Draconians, which includes a hard-hitting tier-3 Flyer (their top-end racial unit) buffed up by one of their priest units — not so much because I’m likely to lose, but because I really don’t want to lose any important units when I fight them. I carefully sandbag them with Cadavers and cast Killer Instinct on one of my Shredders to get requisite firepower to soften up the Flyer. South of Doread, where the terrain turns volcanic, there’s the Seal of Nazar N’Urrath, which I could use to shoot for a Seals victory. It’s guarded by a big stack of elementals, which is, of course, why no one has any Seals points yet. Meanwhile, near the dragons up north, there’s a Heart of the Tropics. 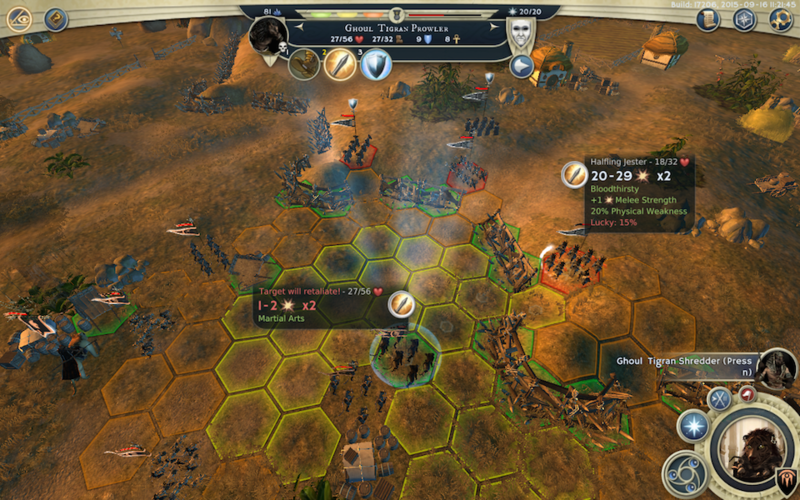 Owning a Heart makes all of your units comfortable in terrain of the matching type. This doesn’t affect me as a necromancer, but the castng point bonus is still really good. It’ll be a while before I can do anything with this one, but its definitely desirable. There’s an orc outpost up there as well. It’s too far away to conquer any time soon, but I have other plans for it anyway. 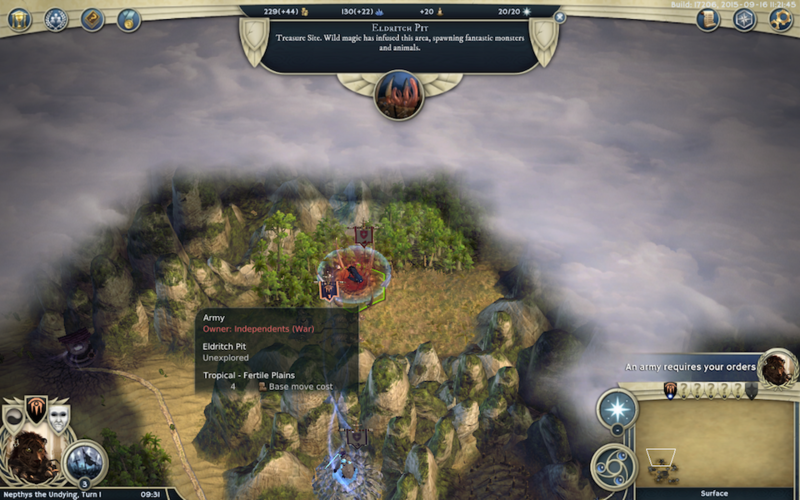 On turn 6, we bump into our nearest neighbor: Algaz Stonecloak, a warlord of the dwarves. He’s already a bit hostile (because we’re evil), but hopefully he’ll give us a bit of breathing room to consolidate before forcing an all-out war. I also attempt to transform Ket’s mana node into a Destruction node, only to find that I can’t: migrating caused the village to shrink to an outpost, so it’s now outside of my domain. I don’t want to waste the three rounds I spent casting it, so I decide to just hold the spell a while, even though that precludes other world-map casting. My second mistake is sending Jafsar’s party to a Well of Souls. The birds guarding it beat his troops up pretty hard, and almost cost me my hero. Moreover, exploring it gives me no immediate resources and it’s too far from any town to really matter in the near term. This is a great example of wasted effort in the early game: both bodies and movement points are precious, so you really should be thinking about how to maximize payoff and minimize risk. At least drinking from the well turns my elf archer into a ghoul for easier maintenance. I send his surviving force back down to the capital to hopefully clear some more stuff. After my capital finishes a Laboratory (which should help with my research a bit), I start an Embalmers Guild. It’s a good idea to make this thing before cranking out ghouls because they tend to be so horribly fragile otherwise. Meanwhile, Nephtys’ party explores some Ancient Ruins, facing an Ogre and two spiders (I sent Jafsar away because these dungeon-style sites are limited to one stack of six going it at a time, anyway). The magic teacup it yields is pretty useless to a necromancer, but I want the research bonus so I take the normal reward instead of the all-gold alternative. Continuing the streak of useless items, a Trading Post battle yields a heals-you-while-you’re-in-the-water fishing spear and a hat that reduces party maintenance costs somewhat. That’s actually a decent bonus but I don’t feel like it’s worth a hat slot (and I can craft an equivalent hat easily later if I disagree). So I take the flat gold this time instead. Nephtys levels up and I spread the points on cheap improvements to her Defense, Resistance, and Ranged Strength. Heroes/leaders are powerful and valuable, and the AI does sometimes focus them pretty hard, so it’s important to pump up their survivability. I take out that monster den we spotted on the first day, gaining a Mystic Archer’s Bane — a projectile damage reflector — in the process. The yellow is Algaz’s domain. You can see his throne city there as well. So he’s got at least two settlements (both village sized at the moment). 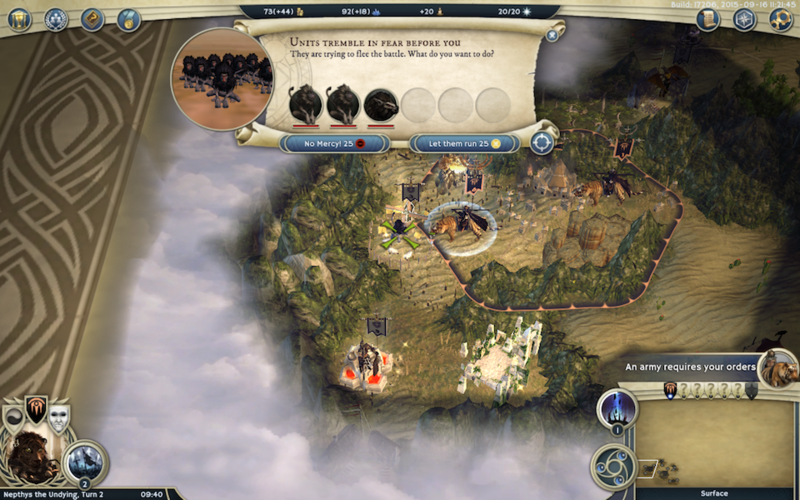 I haven’t been able to scout his armies. 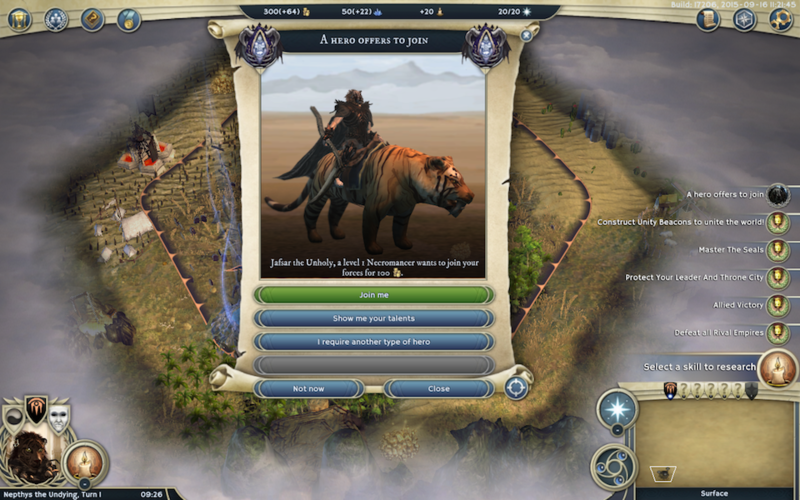 If he does attack me, I should see it about 2-3 turns before he can make it to Tungail, thanks to the Cheetahs I have puttering around over there. Right now, the biggest bottlenecks are casting points and population. Hopefully the two shrimpy cities we gobbled up will bear fruit soon. I’m hoping to mostly leave them alone at the moment, though, while I go for Doriad. Ah, great! An AOW3 WIP. It's a great game, very polished, very fun, and I love necromancers. Seems like a decent start, but I haven't bought the expansions for Necro access. Did they improve the AI in the expansions? I remember having to fight wave after wave of tier3-4 enemy units after a while.